Michelle Smith Lecture Series—In the Hurricane’s Eye-The Genius of George Washington and the Victory at Yorktown. Lecture details the epic and suspenseful campaign through to its triumphant conclusion revealing that the fate of the American Revolution depended, in the end, on Washington and the sea. Series includes three presentations, with a fourth bonus lecture. Registration required. For more information: Mount Vernon, (703) 780-2000. Decorative Arts Tour—Tour delves deeper into Colonial Annapolis, home to a number of highly-skilled craftsmen like John Shaw and William Faris, whose work sat alongside imported pieces from around the world. For more information: William Paca House, (410) 990-4514. Regency Tea Party—Regency afternoon tea includes parlor games and freshly brewed tea and savories. For more information: Historic Bath, (252) 923-3971. Curry’s Spring Gathering—Gathering features primitives, antiques and more. For more information: Curry’s Antiques, (740) 654-1333. Furniture Up Close-Joinery and Early Cabinetmaking—Conference takes an up-close look at masterworks from the Winterthur collection focusing on 17th-century joinery and early 18th-century cabinetmaking. Registration required. For more information: Winterthur Museum, Garden & Library, (800) 448-3883. 73rd Annual Garden Symposium—Symposium explores how to create harmonious gardens and includes guest speakers discussing how to integrate existing elements, effectively combine plants and hardscape materials, and create features of distinctive landscape styles. Registration required. For more information: Colonial Williamsburg, (888) 965-7254. Rocky Mountain Antique Festival—Show features antique & vintage items. At Douglas County Fairgrounds. For more information: Heritage Event Company, (918) 619-2875. Earlier Times Antiques and Folk Art Show—Show offers antiques, primitives and folk art. At Harvest Ridge, Holmes County Fairgrounds. For more information: Earlier Times Antiques and Folk Art Show, (618) 932-6633. Hook In at the Manchester Country Club—Event features vendors, door prizes and more. At Manchester Country Club. For more information: American Country Rugs, (802) 325-2543. 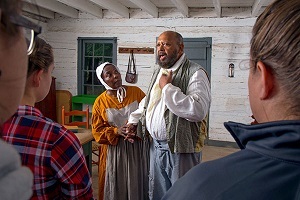 Follow the North Star—Award-winning, interactive theatrical program demonstrating the wide ranging social attitudes toward African-Americans in pre-Civil War Indiana. Participants travel back to the year 1836 and assume the role of fugitive slaves seeking freedom on the Underground Railroad through Indiana. Reservations required. For more information: Conner Prairie, (800) 966-1836. Cocktails by Candlelight—Event features period cocktails, learning to make 18th-century mixed drinks and snacks, and an exclusive candlelight tour. Registration required. For more information: Gunston Hall, (703) 550-9220. Historic Garden Week—Event features house and garden tours of more than 250 of Virginia’s most beautiful gardens, homes and historic landmarks. For more information: Historic Garden Week in Virginia, (804) 644-7776. Patriots Day Weekend—Event features a weekend of living history programs that commemorate the beginning of the American Revolution on April 19, 1775. For more information: Old Fort Niagara, (716) 745-7611. A Revolutionary War Encampment—Encampment features George Rogers Clark and his Illinois Regiment of Virginia beginning their western campaign and includes soldiers and camp followers, 18th-century recipes in the hearth kitchen, and participating in recruitment for new, troops. For more information: Historic Locust Grove, (502) 897-9845. Conversations with Thomas Jefferson—Performance of a conversation between Thomas Jefferson and his good friend, fellow revolutionary and political rival, John Adams. At the Historic Academy of Music Theatre. Reservations suggested. For more information: Poplar Forest, (434) 534-8120. The Gathering at Macktown—Event features presenatations of early Ameican life on the frontier and includes demonstrations of life skills and more. For more information: Macktown Living History, (815) 624-4200. Maryland House & Garden Pilgrimage—Property owners open their historic sites to the public cultivating awareness of Marylands rich architectural and cultural heritage. Each countys tour includes seven or eight properties. For more information: Maryland House and Garden Pilgrimage, (410) 821-6933. The Best of Missouri Life Market Fair—Fair features 100 booths offering clothing, pewter, paintings, photography, sculpture and more. At Powell Gardens. For more information: The Best of Missouri Life Market Fair, (816) 697-2600. George Washington Remembers New Jersey—Presentation focusing on New Jersey’s role in the American Revolution from the perspective of George Washington. In the Dutch barn at Rockingham. For more information: Rockingham Historic Site, (609) 683-7132. French & Indian War Encampment—Event focuses attention on the main protagonists of the French & Indian War - France, Britain and their American Indian allies with demonstrations of military, Indian, and civilian life and re-enactors dressed and equipped as they appeared in North America during the middle of the eighteenth century. For more information: Fort Toulouse - Fort Jackson Park, (334) 567-3002. Jefferson & Adams-On Stage and In Conversation—Special performance of Thomas Jefferson and his good friend, fellow revolutionary and political rival, John Adams. At the Historic Academy of Music Theatre. For more information: Historic Academy of Music Theatre, (434) 846-8499. Sheep Shearing Weekend—Event follows the wool from sheep to cloak with demonstrations of sheep-shearing, spinning, dying, weaving and includes displays of rarely seen Shaker-made woolen items, including the famous Shaker cloak. For more information: Hancock Shaker Village, (413) 443-0188. Asparagus Valley Pottery Trail—Self-guided driving tour of clay studios in western Massachusetts featuring 13 guests in addition to the 9 potters that welcome visitors to their studios. For more information: Asparagus Valley Pottery Trail, (413) 625-2870. Federal Cabinetmaking-Kneeland & Adams of Hartford—Forum shares the ongoing research of the cabinetmaking firm Kneeland & Adams and its significance to the history of commercial craftsmanship in New England. Registration required. For more information: Historic Deerfield, (413) 775-7179. Lives Bound Together-Slavery at George Washington’s Mount Vernon—Exhibition demonstrates how closely intertwined the lives of the Washingtons were with those of the enslaved through household furnishings, art works, archaeological discoveries, documents, and interactive displays. For more information: Mount Vernon, (703) 780-2000. American Folk Arts Rich Cultural Diversity—Exhibit celebrates the 60th anniversary of the museum with approximately 50 objects that include furniture, sculpture and paintings made between the 1700s and the present. For more information: Abby Aldrich Rockefeller Folk Art Museum, 800-hist or y. Painted in Mexico, 1700-1790-Pinxit Mexici—Exhibition devoted to painting in New Spain (Mexico) during the 18th century and offers a fresh perspective on a vibrant period, surveying the most important artists and stylistic developments and highlighting the emergence of new pictorial genres and subjects. For more information: The Met Fifth Avenue, (212) 535-7710. The American Revolution-A World War—Exhibition examines the 1781 victory at Yorktown and the Franco-American partnership that made it possible and features the paintings The Siege of Yorktown and The Surrender of Yorktown, created by Louis-Nicolas van Blarenberghe in 1786 as copies of those presented to King Louis XVI, and George Washington’s early 1780s portrait by Charles Willson Peale, united for the first time in a national museum since their display together in the 1700s. For more information: National Museum of American history, (202) 633-1000. Thomas Chippendale at 300-Treasures from the Collection—Exhibit marks the 300th anniversary of Thomas Chippendale’s birth with objects from the Winterthur collection and explores the expression of rococo style in England, showcases designs by Chippendale and several of his contemporaries and collaborators, and highlights the influence of Chippendales designs in furniture by Philadelphia cabinetmakers. For more information: Winterthur Museum, Garden & Library, (800) 448-3883. Preserving Natures’ Beauty-The Art of Herbaria—The exhibit features artistic look at historic plant specimens and explores the important contributions of botanists and amateur naturalists to Lowcountry natural history with examples of the extensive herbarium collection and highlights their exquisite design elements. For more information: The Charleston Museum, (843) 722-2996. Dutch Masterpieces at the Met—Exhibit features approximately sixty-five works of art focusing on key issues in seventeenth-century Dutch culture�"from debates about religion and conspicuous consumption to painters’ fascination with the domestic lives of women. For more information: The Met Fifth Avenue, (212) 535-7710. Working Like a Dog—Exhibition of sporting and dog paintings, drawings and sculpture celebrating man’s best friend — dogs of all shapes, sizes and breeds — at work and play — hunting, retrieving, herding, racing and guarding from the 17th through the 20th centuries. For more information: Pebble Hill Plantation, (229) 226-2344. Masters of Illusion-The Legacy of John F. Peto—Exhibition features a new look at trompe l’oeil art in New Jersey and includes his legacy through contemporary artists and more. For more information: Morven Museum & Garden, (609) 924-8144. 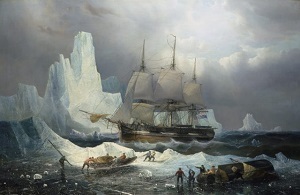 Death in the Ice: The Mystery of the Franklin Expedition—Exhibition pulls together the epic history of the 1845 mission to discover a Northwest Passage to Asia, including expedition materials from London, Inuit culture and knowledge that led to the wrecks’ discoveries from Canada, and artifacts raised from HMS Erebus, seen for the first time in 170 years. For more information: Mystic Seaport Museum, (860) 572-0711. Artistic Encounters with Indigenous America—Exhibition explores how European and American artists represented Indigenous North Americans in drawings, prints, watercolors, photographs, and popular ephemera from the seventeenth to the early twentieth century through forty-five examples from The Met collection. For more information: The Met Fifth Avenue, (212) 535-7710. The Art of London Firearms—Exhibition explores a fascinating and often overlooked chapter in the art of European gunmaking through a selection of important London-made firearms, dating from around 1760 through 1840. For more information: The Met Fifth Avenue, (212) 535-7710. Monumental Journey-The Daguerreotypes of Girault de Prangey—Exhibit features approximately 120 of daguerreotypes the artist, architectural historian, archaeologist, and pioneer photographer took on a three-year photographic excursion throughout the Eastern Mediterranean. For more information: The Met Fifth Avenue, (212) 535-7710. Nature’s Nation: American Art and Environment—Exhibit examines how American and Native American artists have both reflected and shaped our understanding of the environment, tracing evolving ideas about the environment ��" and our place within it ��" through more than 100 works of art from the colonial period to the present by a broad range of artists. For more information: Peabody Essex Museum, (978) 745-9500. Woven Words: Decoding the Silk Book—Exhibit highlights a little-known but magnificent rare book from the Walters’ collection-a 19th-century prayer book woven entirely from silk on a Jacquard loom, invented in 1804. For more information: The Walters Art Museum’, (410) 547-9000. Hex Signs: Sacred and Celestial Symbolism in Pennsylvania Dutch Barn Stars—Exhibition explores themes of sacred and celestial imagery in the traditional arts of the Pennsylvania Dutch with special emphasis on the decorated barns of Southeastern Pennsylvania and includes actual examples of barn stars, decorated objects, and related images. For more information: Glencairn Museum, (267) 502-2600. Inspired Design-Asian Decorative Arts and Their Adaptations—Exhibit highlights 18th- and 19th-century Asian decorative arts and their imitations and explores how Western craftsmen adapted Asian decorative arts into a design vocabulary more familiar to them and their customers, and highlights New Englanders’ own quest for these imported goods. For more information: Historic Deerfield, (413) 774-5581. Life in the Western Country-Arkansaw Territory from 1819-1836—Exhibit celebrates the 200th anniversary of the creation of Arkansaw Territory with historical documents and items that shed light on the culture, experiences, and beliefs of some of the state’s earliest inhabitants. For more information: Historic Arkansas Museum, (501) 324-9351. All Work and No Pay-A History of Women’s Invisible Labor—The exhibit shows that despite making steps forward in the paid labor force, women continued to be responsible for the almost-timeless and undeniably endless unpaid work at home featuring pockets, aprons, housedresses and a variety of other costumes meant for domestic work from colonial America to the 1990s. For more information: The Smithsonian National Museum of American History, (202) 633-1000. American Beauty-Selections from the Richard M. Scaife Bequest—Exhibition showcaseses 50 paintings, celebrating Scaife’s passion for the rich traditions of American art and includes works by Martin Johnson Heade, John Frederick Kensett and Albert Bierstadt, and American Impressionist paintings by Theodore Robinson and more. For more information: The Brandywine River Museum of Art, (610) 388-2700. Thrown, Fired, and Glazed-The Redware Tradition from Pennsylvania and Beyond—Two-year exhibit, running March through December, shows more than 150 pieces each year, encompassing the history of redware- focusing on the differences between redware in Europe, the Northern United States, Southern United States and Pennsylvania. Pennsylvania’s redware tradition will be the major focus of the exhibit, covering archaeological pieces, traditional work, the creation of redware, and the revival of the art form. For more information: Landis Valley Village and Farm Museum, (717) 569-0401. Bullets, Bonds, and Butter-Wilton Responds to War, 1776-2006—Exhibition commemorates the contributions of both the soldiers and the townsfolk who have answered the call of war and includes material from the Revolutionary War, War of 1812, World War I, World War II, Korean War, Vietnam War, and the war in Iraq. For more information: Wilton Historical Society, (203) 762-7257. Made in New York City-The Business of Folk Art—Exhibit portrays the people and places that were part of the city’s thrumming commercial life, and highlights the diverse mediums and formats used by the artists, artisans, and manufacturers. For more information: The American Folk Art Museum, (212) 595-9533. Hamiltons Final Act-Enemies and Allies—Expanded exhibition features the original handwritten letters that fueled the ongoing war of words between Alexander Hamilton and Aaron Burr. 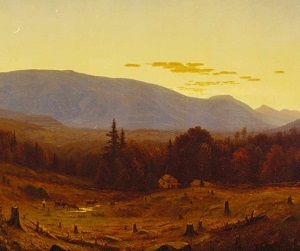 For more information: Fenimore Art Museum, (607) 547-1400. Revolutionary Reflections-French Memories of the War for America—Exhibition focuses on the age of democratic revolutions that swept over France and challenged the old order throughout the Atlantic world and the French officers who served in the American War of Independence with journals, memoirs, and portraits reflecting their impressions of Revolutionary America and their memories of service to king and country and to the cause of American independence. For more information: The Society of the Cincinnati, (202) 785-2040. From Sea to Shining Sea-200 Years of American Art—Exhibition presents works that span the first two centuries of our history, highlighting the variety and strength of American artistic achievement from the colonial era through World War I. For more information: M.S. Rau Antiques, (888) 711-8084. 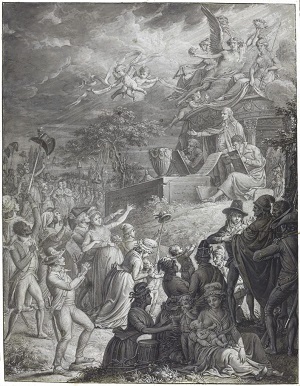 Paper Revolutions-French Drawings from the New Orleans Museum of Art—Exhibition traces the politics of draftsmanship in the eighteenth and nineteenth centuries featuring works on paper by celebrated painters. For more information: New Orleans Museum of Art, (504) 658-4100. Craftsmen and Consumers-Transatlantic Commerce in 18th Century Newport—Exhibition explores Newport’s budding prominence in the transatlantic trade networks of the 18th century showcasing examples of luxury items purchased by residents from abroad and created by Newport craftsmen for sale both at home and overseas. At the Brick Market. For more information: Newport Historical Society, (401) 846-0813. The Impressionists Eye—Exhibit features a broad range of Impressionist sculpture, painting, and works on paper of Claude Monet, Mary Cassatt, Vincent van Gogh, and others shown together. For more information: Philadelphia Museum of Art, (215) 763-8100. Yoshitoshi: Spirit and Spectacle—Exhibition showcases seventy works from the Museum’s collection of Yoshitoshi prints from the heroism of samurai warriors, poetic images of figures in nature, female beauty, historic accounts, ghost stories, and the horrors of the battlefield. For more information: The Philadelphia Museum of Art, (215) 684-7650. Baby Animals-Heritage Breeds at the Banke—Event showcases a variety of more than a dozen heirloom breeds to learn more about domestic livestock typical on coastal northern New England farms from the 17th century to present day. For more information: Strawbery Banke Museum, (603) 433-1100.